1.1 What is the best corded drill though? This is an updated review of the best corded drill in 2018, but we’ve now included some gems of early 2019 too. Corded drills are light weight as there is no battery. It requires a power source and thus always have power for any kind of tasks. It can be used for various tasks like drilling, running wire brushes, mixing paint, using car polisher buffers and much more. It has high torque and power. There is no need to charge and replace batteries. The corded drills have been around in usage for a long time and have been improved widely. There are a number of features to consider before buying a corded drill. It should be of a good quality and at a reasonable price. It should handle a wide range of materials like wood, masonry, metals etc. Below are some reviews and features of the best corded drills for various purposes. What is the best corded drill though? You’re probably wondering, what is the best corded drill? Below you will find the top 5 best corded drills on the market. Makita HR2475 1-Inch D-Handle SDS-Plus Rotary Hammer is a corded electric hammer that delivers a hard hitting performance and more productivity with less vibration. It is a versatile tool for masons, remodelers, electricians, maintenance crews and general contractors.It drills quick holes in concrete and only takes a few seconds to do it It has an innovative technology and a best in class engineering.It is powered by a 7 AMP motor that delivers a no-load speed of 0-1,100 rpm, with 0-4,500 BPM and 2.7 joules of impact energy. It has three modes of operation rotation only, hammer only and rotation with a hammer which is used for multiple jobs.It is engineered with Makita motors that have a field core interlocking steel laminations, dual ball bearing armature and more copper commutator bars. It gives an efficient transfer of energy for more power and longer tool life.It has a torque limiting clutch that prevents gear damage by auto disengaging gears if it bends. It has a unique sequential impact timing property. This gives a timed hammering during rotation that minimizes overlapping bit impacts which give 50% faster-drilling speed. It has an ergonomic and well-balanced design with a rubber D handle for a comfort grip and a soft grip side handle. It also has a one-touch sliding chuck for easy bit changes, lock button for continuous usage and a large trigger switch. The bit can be set in 40 different positions as it allows multiple chisel positioning.It has a recessed lock-on button that allows continuous use. It has a built-in torque limiter that ensures a stable torque control. It weighs 10.7 pounds and uses a voltage of 120 volts.It includes a side handle, depth gauge, and a tool case. It can also be used for small jobs and home use. Overall it is good quality tool that lasts longs and comes with a warranty. 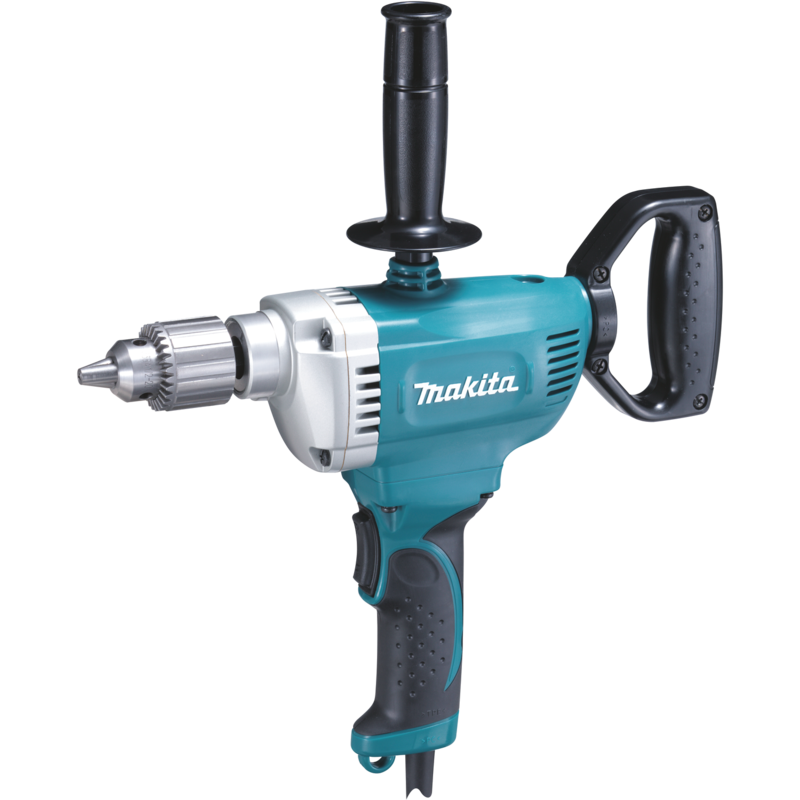 Makita DS4011 1/2-Inch Drill is a corded drill that uses electric power. It has a powerful 8.5 AMP motor specially designed for improved drilling and mixing performance. The 600 RPM gives an increased speed and torque for drilling larger holes. It has a well-balanced design and weighs only 6.3 lbs for reduced operator fatigue. It can be operated in multiple positions. The D-handle rotates at a 360-degree angle with 24 possible stops at different positions. It has an all ball bearing design for smooth operation and long tool life. It is a heavy duty power drill with a ½’’ drill chuck specially designed for positive bit retention. It has a rubber handle for a steady and comfortable operator grip. It has an on board chuck key storage that allows the bits to be changed fast and easily. The rocker switch feature allows quick transition between forwarding and reverses operation. It is double insulated with a drill chuck, chuck key, and a side handle. It has higher drilling speed that is convenient for drilling holes in various materials like steel, aluminum, concrete etc. It is a reversible drill that can alter rotations from a clockwise direction to an anticlockwise direction. This makes it suitable for both drilling holes and driving screws. It has a large chuck diameter that is compatible with a wide range of tools and bits. This tool has a long cable length that allows more movement It comes in two styles, one with a variable speed and the other with a non-variable speed. Overall it’s a great pick and is a reliable tool with a long life so you’re in good hands. DEWALT DW130V 9 Amp 1/2-Inch Drill with Spade Handle is specially built for rugged jobs which requires high torque which burns out the batteries in small battery operated drills. The DEWALT DW130V 9 Amp 1/2-Inch Drill with Spade Handle is ideal for jobs that require downward pressure. It has a side handle with three positions and a rear handle with two positions. These handles are adjustable so that you can move them to ensure proper leverage. The DW130V produces up to 500 RPM torque. It increases productivity and decreases fatigue as it has less vibrations.This torque range efficiently meets the needs of a wide variety of applications including drilling and mixing paint and drywall mud. It has variable speed reversible switch which reduces the air bubbles when mixing mud. It gives you total control when grilling and has a soft grip handle for comfort. It can handle spade bit drilling in wood up to 1-1/2 inches, self-feed bit drilling in wood up to 2 9/16 inches, hole saw drilling in wood up to 5 inches, auger bit drilling in wood up to 1-1/2 inches, twist bit drilling in steel up to 1/2 inch, hole saw drilling in steel up to 3 inches. Overall this drill is extremely comfortable and easy to hold. If you’re looking for something that’s a bit more affordable this could be the best pick for you. It is reliable, cheap and a long lasting tool. The Bosch RH328VC 1-1/8-Inch SDS Rotary Hammer has a good combination of power,impact energy, drilling speed and comfort. It has a special vibration control feature that gives excellent performance. It has an excellent power to weight ratio that allows fast chiseling and fast drilling. 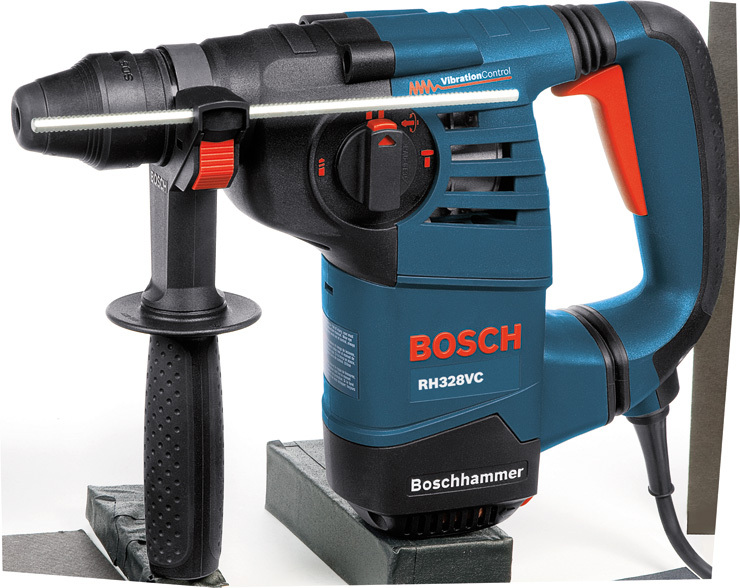 The Bosch RH328VC has three modes of operation, hammer only, rotary only and rotary hammer mode. This tool is more versatile because of the integral clutch. It comes with a carrying case and an auxiliary handle. It has a two step vibration control and does not compromise on the performance. The vibrations are reduced in two steps, beginning from the impact mechanism and then progressing to the handle. The handle has rubber dampening elements on the top and the bottom. It is powered by an 8 amp motor and it has a weight of 7.7 pounds. It gives an impact energy of 2.6 ft/lbs. It has a variable speed three finger trigger for better control and accurate bit starting. The modes can be switched using the multi function selector. The torque can be minimized by an integral clutch. The flexibility of this hammer is further enhanced by a 360 degree auxiliary handle. Although vibrations aren’t everything, with this and the great amount of force that comes from this drill, it makes it one of the top ones to get. It is a high quality reliable tool with a fair pricing. The Dewalt DWE1014 3/8-Inch 0-2800 RPM VS Drill with Keyed chuck has a speed range of 0-2800 RPM which is variable. It allows to control the speed according to the wood or material used and makes work simple. The speed trigger can be operated easily without any assistance. It can perform heavy duty tasks, can penetrate nails on the hardwood and can be used for both home use and commercial purpose. It is lightweight and it weighs around 3.9 pounds only. The lightweight drill allows it to be used and held for a long time. It works on 440 watts and has a 3 year warranty. The DeWALT drill has an amazing performance capacity. It has a ⅛ inch bit retention for wooden materials and a deep ⅜ inch capacity for steel materials. This can be used on a diverse range of materials and works on 120 volts. It is a quality reliable product that is flexible for different projects. Although it may not be cheaper terms of price it’s still a very powerful drill so very good value for money. The most obvious difference between a cordless drill and a corded is of course the power cable. The corded drill offers far higher power and weighs less than a cordless model with similar capabilities. Watch out for the amp rating as this represents the power of the drill. The power supply means greater run time and no need to stop to recharge a battery which of course is extremely convenient over small distances, but on the flip side of this, the cord does restrict mobility. Of course, this depends on how far your work area is from the outlet, but in this case, you can just use an extension cord. Be safe when using these extension cords as improper usage can be dangerous. Depending on the task at hand, some capabilities are necessary for certain tasks. It’s important the drill has the ability to change speed with a clutch that’s adjustable. This will provide you with the versatility to drill a magnitude of different materials with a variiaty of bits. Every material requires a different speed and torque, so this is worth considering when drilling through soft/hardwood, metal and masonry. As a rule of thumb, the harder the material the slower the speed and higher torque, with softer materials it’s the opposite, faster speed with a lower torque. You are always fully in control of the speed with the trigger that controls it, just make sure you try to keep it constant for control. The clutch controls the torque level. The clutch needs to be at the right level or you may find that you drill too deep or even snap a screw in two. Look for a drill with the flexibility to change torque through gears. Most tools have a keyless chuck which is far more convenient, even for the more experienced user. Ones that have a keyed chuck will require a tool to loosen but this is less common. If you’re constantly changing then it’s worth looking at a drill that’s keyless. Built-in lighthelps you see where you’re drilling or driving. Built-in levelwill improve your accuracy of drilling. Side handle: Provides higher stability when holding the drill. Accessories:Driver bits, extension cords and a carry case or bag are all useful accessories. Any tool should feel comfortable when you use it. It should be comfortable when you first pick it up as well as a few hours later. Obviously if the drill is very heavy then it might not be the right one for you so consider this too. Although some may weigh more than others, with the design it actually may not feel heavier. Many corded drills have a pistol-grip design which means the handle is at the rear, this should help distribute the weight better so less wrist strain.